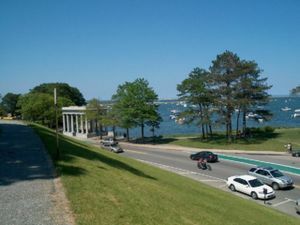 Plymouth,  "America's Home Town", is in Massachusetts on the South Shore. Plymouth includes the villages of Cedarville, Manomet, North Plymouth and West Plymouth. It has the largest area of any town in Massachusetts -- about 100 mi² (259 km²). 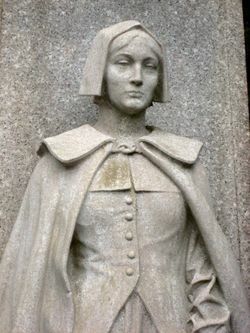 As the landing place of the Mayflower and its Pilgrims arriving from England in 1620, it was among the earliest settlements of Europeans in North America. Half the original colonists died during the first winter. A picturesque harbor is the backdrop for a trip into colonial history. In winter you'll want to dress warmly. Once a largely blue-collar town supporting the fishing, shipbuilding and rope-making industries, in more recent years Plymouth has become more mixed. Advancements in transportation and large housing developments have brought many young parents who commute to Boston and retirees who appreciate the area's charms. Because of its history, tourism has always been a part of Plymouth. It is a favorite day-trip destination for many nearby New England residents, some of whom just come for a pleasant day walking around town. Others spend a day fishing or enjoying the bike trails or ponds of Myles Standish State Forest. It is also a great place to hire a fishing charter or whale watch, or, if staying, to explore Cape Cod or Boston. September and October can be excellent times to visit. It is less crowded and is less hot and humid than the summer. September brings excellent fishing as the bluefish have fattened in more northern waters and are migrating back southward. In October the trees put on their colorful show and the air becomes crisp and cool. If you haven't seen a wet cranberry harvest, try to catch that at one of the many bogs in Plymouth or Carver. This area used to be the largest producer of cranberries until surpassed by Wisconsin in the late 1900s. Harvesting starts in late September. Plimoth Plantation, a "must see", is open daily until after Thanksgiving in late November. Of course, Thanksgiving is Plymouth's big day. The Pilgrims celebrated the first Thanksgiving dinner here in 1621 with their friend Massasoit, Sachem of the Wampanoags. However, it was first officially observed in 1637 upon return of members of Plymouth Colony who had gone to participate in a massacre of the Pequots at Mystic. A tenuous relationship between the colonists and the natives ensued until erupting in war for fourteen months of bitter bloodshed in King Phillip's War in 1675. For several decades, Native American groups and their supporters have held their own "Day of Mourning" -- an attempt to reveal the darker side of colonial history often masked in the idyllic telling of the Thanksgiving story. 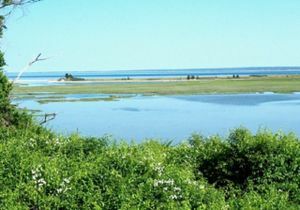 If you will be staying for a week, you'll want to make a day trip or two to Cape Cod for the charms it has to offer. Before Memorial Day or after Labor Day you may avoid the Cape's weekend traffic congestion which can be maddening at peak times. Plymouth receives many visitors year-round who are researching their ancestry. Whether seeking a tie to Mayflower colonists or not, a trip to Plymouth Public Library is worthwhile. The library (at 132 South St.) maintains a large room dedicated to genealogy. Of course, for those seeking information about the Mayflower Pilgrims, the General Society of Mayflower Descendants (4 Winslow St.) is the recognized authority and has plenty of resources. 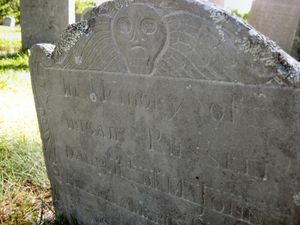 There are also plenty of graveyards to wander through (real genealogists enjoy that). As one cemetery superintendent was heard to say, "People have been dying here for a long time." Plymouth runs a staffed Visitor Information Center, 130 Water St., +1 508-747-7525 or +1 800-USA-1620, . Maps, postcards, cameras, rest rooms. They also sell tickets to tours and cruises. Town Wharf, a location for many harbor excursions and restaurants is across Water Street from the Visitor Info Center. The wharf area extends north from there. The major local newspaper (published W,Sa) is the Old Colony Memorial, Memorial Press Group, 9 Long Pond Rd, +1 508-746-5555, . Plymouth vs. Plimoth - No you are not seeing things on Water Street if you notice a sign giving directions to Plimoth Rock and Plymouth Town Hall. "Plimoth", the old English spelling, is sometimes used to denote a historic site (e.g. Plimoth Plantation). Town sites will be spelled Plymouth Town Hall, Plymouth Courthouse, etc. Thus, you may notice an exit sign from Pilgrims Highway that reads "Plymouth / Plimoth Plantation." Plymouth is not quite an hour south of Boston via Interstate Rt. 93 and Rt. 3 (exit 6A). It is also possible to exit off Rt. 3 anywhere and head east to Rt. 3a south for a more scenic (and slower) trip. It is also about an hour and a quarter drive from Providence, RI which makes that a reasonable regional airport access to Southeastern Massachusetts. Parking -- Plymouth has a new system at town lots. You buy a ticket from machines at the yellow pay stations and place it on your dashboard. Try to have dollar bills and quarters available if you plan on parking at Town Wharf or elsewhere downtown. Be sure to add time to the extent you want before putting your money in the machine. Change is not always given by the machines. Plymouth Municipal Airport (ICAO: KPYM), 246 South Meadow Road, +1 508-746-8003, . Small, regional airport. Most travelers would fly into Boston's Logan International Airport(BOS) or Warwick, Rhode Island's T.F. Greene Airport(PVD). Take the Plymouth/Kingston line  from Boston's South Station on the MBTA  Commuter Rail, until terminal at Plymouth station. Trains alternate on this line, ending either at Kingston or Plymouth. The Plymouth terminal is at Cordage Park, about a mile away from the main tourist area. From there you can take a GATRA bus  or call a taxi. Plymouth and Brockton Street Railway Co., 8 Industrial Park Rd., +1 508-746-0378, . Connects Boston and the southeastern Massachusetts seaboard including Cape Cod. There is an express bus connecting to Logan airport in Boston. Harbormaster, Town Wharf, +1 508-830-4182, (VHF Channel 16),. Some great aerial pictures of the harbor at this web page--scroll down. Plymouth Brewer Marine, Union Street, +1 508-746-4500, . Full service boat yard. The main tourism areas of downtown and "waterfront" are very walkable. Pick up the pamphlet, Pilgrim Path, A Walk Through History at the Visitor Center on Water St. near Al's Restaurant. The GATRA Busses Phone:+1 508-801-2300,. M-F 6:20AM-6:10PM, Sa,Su 8:20AM-6:10PM. Runs several routes from downtown. Wheelchair accessible. America's Hometown Shuttle, 8 Industrial Park Road., Phone:+1 508-746-0378, Seasonal -- M-F 6:20AM-6:10PM;SaSu 8:20AM-6:10PM, has an all day fare and offers a one hour narrated historical tour loop in Plymouth departing from Plymouth Rock. Bettyann's Tours of Plymouth, departs from the Visitor Center on Water St. or will pick you up, 508-224-6469, E-mail: [email protected], . Personalized tours. Offers a rare on-site look at the inside workings of the cranberry harvest starting late September. Outside the downtown area, Plymouth is a collection of villages. Driving on Route 3A south from downtown you'll drive past some grand houses with a direct view of the harbor; over the "Pine Hills"; then down past Pilgrim Nuclear Power Plant into Manomet. Grab an ice cream at Gellars (a long-time institution) then follow the sign left off 3A to White Horse Beach. You'll bend to the right (south) along the beach and drive past the packed-in patchwork of cottages. Be sure to notice the white horse in someone's yard on the right. When you reach the end go left and park behind the Lobster Pound  (live lobsters and other seafood goodies available inside) at Manomet Point. The point is a nice place to stop and view the coastline. When leaving go left on Point Rd, following it back to a left back onto Rt. 3A. Continue heading south past Sweet Lemons Restaurant (great pecan french toast if you're hungry) then past Indian Brook School. To get some nice views of the coast take lefts at Center Hill Road (across from Belleview Dr.) and Ellisville Road (look for Ellisville Harbor State Park -- stop there to stretch your legs if you like) to enjoy some nice views of the coast. Both roads rejoin Rt 3A. Ellisville Road skirts a wonderful salt tidal marsh, home to various birds including Great Blue Herons. Further on a couple of swans float serenely in a pond. Go left and soon you are in the small village of Cedarville. On a hot summer day the temperature is usually about 10°F (6°C) cooler here than downtown due to the nice sea breeze. The British Beer Company is the local watering hole and family restaurant. For a hearty breakfast and /or nice pastries try The Blueberry Muffin. The Cape Cod Canal is now just two miles further south (see Wikitravel's article on Bourne). If you decide to go there, take Herring Pond Road to your right and go under the highway (Rt. 3). The road bends by Great Herring Pond and ends in Bourndale village at the Herring Run rest area adjacent to the Canal. (The herring run during April and early May.) There are you can park your car at the recreation area and stroll along the canal or visit the Corps of Engineers' facility (with rest rooms). If it's a cool fall day you might just spot a harbor seal. From the south end of downtown take Summer Street (Main St. to Market St.) past the John Carver Inn on your right and Sparrow House and Jenny Pond on your left. Proceed up the hill past the old houses that crowd the street. When you see Amos Hill Road on your right, prepare to take the next left onto Billington Street. The road winds alongside Town Brook on its left. The freshwater availability of Town Brook was an important reason for the Pilgrim's selection of this site. Pass under the old concrete underpass of Rt. 3 and you will see Morton Park Road straight ahead. This is a dirt road that circles Little Pond and skirts one side of Billington Sea (bear right at the split after the little cranberry bog on your left) leading to the paved parking area. Get oriented here so that you can find the way back out the way you came in. Leaving Morton Park the way you came in, take a right back onto Billington Street. The forests here are among Plymouth's oldest and best and soon you pass Lout Pond, for years a drinking water source, on your right. Several stately homes have been built in here to take advantage of the relative seclusion. Soon you will have an expanse of cranberry bogs on both sides. They are often flooded in cold weather to protect the plants, or to float the berries if they are wet harvested. Billington Street becomes Watercourse Road and later Rocky Pond Road, but chances are that you won't notice either. Little South Pond soon appears on the left at the intersection with Drew Road, and then you see Watercourse Place on your right. This begins a long drive through the scrub pines into the Myles Standish State Forest. Eventually you will see a 25MPH speed sign followed by a sharp curve. That's Curlew Pond on the right and Widgeon Pond on the left. Up ahead Rocky Pond Rd goes off to the right and you continue on Bare Hill Road, a long winding road through the scrub pines. Around dawn or dusk it wouldn't be unusual to see deer along here. Still, the unchanging landscape, broken only by the occasional high power line, can be mindnumbing even though it's only for a couple miles. After all this you will be ready for the sharp left onto Lower College Pond Road. Immediately you are rewarded with New Long Pond lapping up to the road on your right like an old friend. There is usually someone fishing from the roadside here. This area exhibits many "kettle ponds" common to southeastern Massachusetts and Cape Cod. They were formed when the glaciers retreated, leaving ice chunks in the sand. The road becomes a fun rollercoaster, but be cautious in here as there are often pedestrians or bicyclists. Further on you will see the low brown fence surrounding the parking area ($5) at College Pond. The parking fee will be worth it if you brought your swimsuit or a picnic lunch, or just need a place to get out after your trip through the scrub pines. Continuing on (right out of the parking lot) you come to a stop and then go straight ahead on Alden Road. At the end, go left on Long Pond Road which gradually gets you back to civilization as we now know it, just south of downtown. Or, for more scenic viewing, at the sharp curve take a right onto Jordan Road (which later becomes Clifford Rd). At the end of this go left on Warren Av., north along the coast to return to downtown. Golden Gull Studios, 17 South Park Av., +1 508-746-8091, . Kusmin Art Gallery, One North Green St., +1 508-746-9215, [email protected], . W 10AM-5PM; Th 12PM-8PM; F,Sa,Su 11AM-4PM. Nationally recognized artist captures the Plymouth/Cape scenes. S. J. Nichols Gallery, 58C Main St., +1 508-746-0066, . Paintings and photography, yes, but a variety of other art here. Free Concerts on the Waterfront, by various bands are given Wednesday and Thursday nights outdoors during the summer near Plymouth Rock. July 4th Celebration, Plymouth Waterfront, The Plymouth Philharmonic Orchestra plays patriotic music followed by fireworks. Blessing of the Fleet, Plymouth Harbor. Sunday, July 5 (2009), 11AM-3PM. "Blessing of the Fleet" at 1PM is a tradition asking for safety of mariners, good harvest from the sea, clean waters and good will and peace among peoples of the world. Activities throughout the day will include the. Also features a boat parade, a memorial service at the waterfront monument dedicated to "In Memory of Those Who Chose the Sea," refreshments, food, entertainment, nautical theme booths, displays, crab races, and rowing contests. Local bands provide entertainment. All boats, commercial or pleasure, are invited to decorate their boats and take part in this celebration. Plymouth Antiquarian Society's Summer Fair, Hedge House, 126 Water Street, Saturday August 22, 2009, 10AM-3PM. Waterfront Festival, mid-late August (Aug 29,30 in 2009),. Live shows, crafts, children's activities and vendors. Crosswinds Golf Club, 424 Long Pond Rd., +1 508-830-1199, 18 hole, 7056 yds, Par 72. Pinehills Golf Club, 54 Clubhouse Dr., +1 508-209-3000,. Comprehensive facilities with three golf schools. Jones Course, 36 hole, 7175 yds, Par 72. Nicklaus Course, 36 hole, 7243 yds, Par 72. Southers Marsh Golf Club, 30 Southers Marsh Ln., +1 508-830-3535,  18 hole, 4111 yds, Par 61. Unique in that the course runs among cranberry bogs. Squirrel Run Country Club, 32 Elderberry Dr., +1 508-746-5001, 18 hole, 2859 yds, Par 57. Waverly Oaks Golf Club, 444 Long Pond Rd., +1 508-224-6700, . Full practice facilities. Great restaurant. Championship Course, 27 hole, 7114 yds, Par 72. Challenger Course, 27 hole, 2264 yds, Par 33. Saltwater fishing for bluefish and striped bass is excellent just off the coast of Plymouth in late summer and early fall. Many people simply surfcast off the jette in the harbor or from local beaches. Cod, haddock, pollock, tuna, mackerel, flounder, tautog and smelt are also caught in the area. There's a very busy concrete boat ramp next to Town Wharf. Several charterboat operations are available. Boat rentals and bait are available at Town Wharf for fishing in the harbor area. The nearby Cape Cod Canal in Bourne is another popular fishing spot. It is said there are 365 ponds in Plymouth -- one for each day of the year. They range in size from "seasonal" to Great Herring Pond's 376 acres. Most have limited or no public access. A concrete boat ramp is maintained at Long Pond (on West Long Pond Road, about three quarters of a mile from Route 3's Exit 3). Long Pond is deepwater and is stocked with trout. Smallmouth and Largemouth Bass can also be caught there. Some boats can also be launched at the very shallow south end of Great Herring Pond. Fishing there is mainly for bass and pickerel. Herring run from the Cape Cod Canal to Great Herring Pond. Fishing is also possible throughout the Myles Standish State Forest in West Plymouth. Fishing licenses are required for freshwater fishing and there are various fees for freshwater licenses according to age or resident status. Saltwater fishing does not require a license (shellfishing usually does), but there are regulations, . Plymouth Long Beach, Warren Av. (Route 3A) (south of downtown about 2.5 miles on left just before Bert's Stone Forge restaurant). Parking: $10; $15 weekends. Lifeguards, restrooms, food. A beach ferry is available for transportion to and from the limited access beach; inquiries can be made at Plymouth Watersport, 24 Town Wharf, +1 508-747-1577. Whitehorse Beach, Take Rt. 3A south, go left at Rocky Hill Road. Follow to end, take a left onto White Horse Road look for parking on right. Parking: varies $2-$5 Occasional ice cream truck, no restrooms or lifeguards. Scusset Beach, End of Meetinghouse Rd./Scusset Beach Rd. (Exit 1a off Rt 3), Sagamore Beach village in Bourne, +1 508-888-0859. State-run beach just north of the east end of the Canal and just south of Plymouth. Picnic tables, food, playground, rest rooms, lifeguard, camping area. Parking: $7 April-November or season pass $25. Ellisville Harbor State Park, on Route 3A about 12 mi (19 km) south of downtown. Free parking, no facilities or lifeguards. Travel lightly - it's a walk to the water. A wonderful natural area to stroll. Many types of birds can be seen in the nearby marsh and along the beach dunes. Morton Park, From downtown take Summer Street west, go about 1.5 miles first street on left. Parking fee: $5. $8 on weekends. Picnic tables, food, playground, lifeguards in summer. College Pond, Take South Street and Long Pond Road (Rt. 3, Exit 5) for about 7 miles to Myles Standish State Forest. Enter state forest and follow signs to the pond. Parking: $5. Restrooms and lifeguard. Fresh Pond, Take Route 3A south to Bartlett Rd, Manomet. Free parking, restrooms, lifeguards in summer. Fried seafood or lobster someplace on Town Wharf. Cranberry wine from Plymouth Winery, 170 Water St., +1 508-746-3532. Salt water taffy from Miller's Country Store, Water St., +1 508-830-0824. A souvenir from Village Landing Marketplace, 170 Water St., +1 508-747-5335. Cranberry chocolates from Old North Street Tea & Curiosity Shop, 31 North St., +1 508-746-1014. A glimpse of the future from Crystal Chambers, 66 Samoset St., +1 508-746-5532. Psychic palm and tarot card readings. Step into the Magical World of Ishtar's Avalon, 65 Main St., +1 508-746-1092, . Tarot and Rune readings, crystals, candles, wands, and more - Plymouth's Witch Shoppe. Expect all listings to be year round. Smoking is not permitted in restaurants unless outdoors. East Bay Grille, 173 Water St. (Town Wharf), +1 508-746-9751, . Lively piano bar Thursday through Saturday evenings and Sunday jazz. Summer evenings rock at this place with an outdoor tent and a younger crowd. The Vine - European Style Wine Bar, 18 Main Street Ext., +1 508-830-1942, . Open daily 4PM-11PM (F,Sa until 1AM) in Summer; Closed Monday from Labor Day to Memorial Day (early Sep-May). Indoors or out overlooking Brewster Gardens. British Beer Company, 6 Middle St., +1 508-747-1776, . Cozy English-style pub, sitting room upstairs with wood paneling, tufted leather armchairs, and darts. Wide selection of craft and international beers. Frequent live entertainment. Sam Diego's, 51 Main St., +1 508-747-0048, . Pool tables and darts upstairs. Young crowd. T Bones's Roadhouse, 22 Main St., Casual. Frequently has live music. The crowd most nights is overwhelmingly young and single. T K's Eating & Drinking Saloon, 38 Main Street Ext., +1 508-747-2373. Pioppi's Package Store, 183 Court St., +1 508-746-1943. Liquor store with the best selection of wines. Just north of down town. The Deck, 14 Union St. (at Brewer Marine), +1 508-747-4503. Tucked behind Brewer Marine, this is a happening place with great food and drinks. Lukes Liquors, 736 State Rd., +1 508-224-6766. Grab some beer or a bottle of wine to go with that lobster! Located on the Rte 3A (State Rd) end of Manomet Point Road in Manomet village's former Post Office. A Beach House Oceanfront, 429 Center Hill Rd., +1 508-224-3517, . The Colonial House Inn, 207 Sandwich St., +1 508-747-4274, E-mail: [email protected], . 7 rooms. The charm of a country inn. Views of the Harbor and Long Beach from the roof deck. Air conditioning, cable TV. Enjoy the beach of their sister property, The Pilgrim Sands Motel, a mile away. Above the Bay at Thornton Adams Bed & Breakfast, 73-C Warren Av., +1 508-830-1849, Email: [email protected],  Classic colonial home with ocean views, en suite private baths, jacuzzi tub, full gourmet breakfast. Could walk to town. Auberge Gladstone, 8 Vernon St., +1 508-830-1890 or +1 866-722-1890, Email: [email protected], . Short walk to the harbor, Private luxury guest suites with deluxe tile and marble baths. En-suite breakfast. Water views, fireplaces, outdoor jacuzzi, deck, and free bicycles. Barbara's Bed and Breakfast, 62 Cooke Rd., +1 508-747-4454, E-mail: [email protected], . 3 rooms. Peaceful rural wooded/garden area away from downtown. Full, scrumptious breakfast, wireless internet access; Private baths. Bayberry Inn Bed & Breakfast, 12 Hall St., (North Plymouth) +1 508-830-1897, E-mail: [email protected], . Turn of the century wrap around porch with ocean views on this restored 1890 colonial home offers its guests access to much of the main house. By the Sea Bed & Breakfast, 22 Winslow St., +1 508-830-9643, E-mail: [email protected],  Great location overlooking the historic waterfront and Mayflower II. All suites have spectacular ocean views. The suites are air conditioned, have private entrances, private baths, TVs, and refrigerators. The Jesse Harlow House, 3 North Green St., +1 508-746-6877, E-mail: [email protected],. Walking distance from downtown and Plymouth Rock. Bedrooms are on second floor. Wireless network available for Internet. Two-night minimum, weekends in season (5/31-11/30). Well behaved children over 12. No pets. Seabreeze Inn Bed & Breakfast, 20 Chilton St., +1 508-746-0282, Fax: +1 508-746-3282, email:[email protected], . 3 suites. An 1890 Victorian style home located in the heart of historic Plymouth Harbor with beautiful ocean views. Walk to most attractions, dining and shopping. Built in 1890, once the home of a New England sea captain. Private bath, cable TV, air conditioning, refrigerator and private entrance. If traveling to Boston by car, the best time to leave during workdays is before 6:30AM or between 9:30AM to 2PM to avoid traffic. 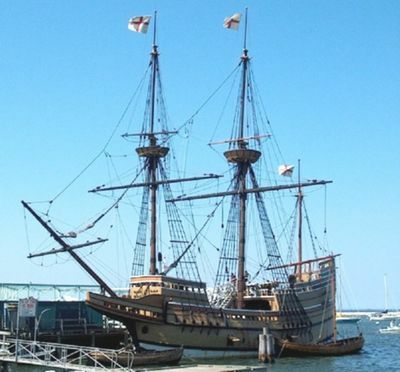 Take ferry trip to Provincetown from State Pier (where the Mayflower II is docked). The ferry (508-747-2400) leaves at 10AM and returns at 6PM. This page was last edited on 4 March 2016, at 15:32.